Glassdoor has helped thousands of job seekers find the right company for them. As many readers already know, the website features reviews and commentary from both current and former employees. By providing insider information to potential employees, it’s a service that has revolutionized the job hunt—creating more transparency in the workplace, both in the US and abroad. I know I’ve used it in the past, and many of my current co-workers have commented that it was the first place they went when they decided to look for a new job. Software Advice set out to find the answer to this question. We surveyed a random sample of 4,633 respondents in the US, collecting a minimum of 500 responses to each question, in order to learn what impact Glassdoor reviews have on a job seeker’s decision to apply for, and accept, jobs. So, is your company’s Glassdoor profile really being viewed by potential applicants? According to our survey, the answer is yes. Out of 4,633 respondents, 2,201 had used Glassdoor at some point in their job search. That’s approximately half our data set. When do job seekers use Glassdoor? 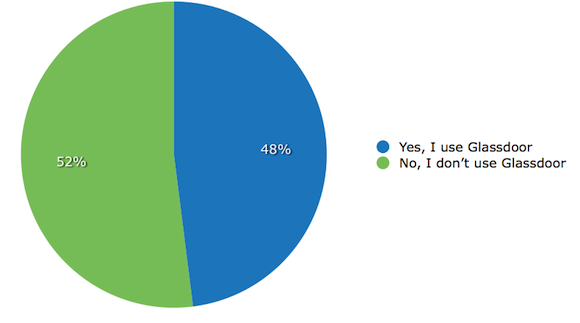 Almost half of our respondents say they use it before they even think about applying for jobs. Glassdoor serves as a way to narrow down the options and create a select group of companies that job seekers will then consider as potential employers. Simply having a Glassdoor profile can therefore increase your visibility to job seekers and potentially increase the number of applications you receive. To drill down into this rating system a bit more, we asked respondents which categories mattered the most to them when deciding to apply at a company. As it turns out, positive reviews in the compensation and benefits category were most important to job seekers. Meanwhile, good ratings of work / life balance came in at a close second. These are important trends to note, as ratings in these are areas that your company can control directly. We also asked the reverse question: “When checking a company’s Glassdoor ratings, what would most impact your decision NOT to apply to a company?” The results reinforce the conclusion that compensation and benefits are most important to job seekers, as a quarter of our respondents said that poor ratings in this category would deter them from applying. If you have low ratings in these categories, you can encourage employees to write about their compensation and benefits, and comment on the work / life balance at your organization. If it is still difficult to generate positive scores for these categories, then you may think about ways to improve them in order to make sure you’re not missing out on great talent. Finally, Glassdoor averages employees’ ratings in these five categories to give the company an overall rating. To determine how important this rating is to job seekers, we asked respondents what overall rating would cause them not to apply at a company. We were surprised to find that 40 percent of respondents said they would apply at a company as long as it had a rating of at least one star. However, it is important to note that by having a low rating, many candidates may be deterred—one third of job seekers said they required a company to have at least a three star rating. So if your company currently has a low overall rating, you can try to improve it by encouraging current employees to post reviews. Your average should become more fair—and rise—as more employees contribute their feedback. Not to mention, just by asking for their comments, you’re showing you value your employees’ opinions. In addition to the star-based rating Glassdoor provides for each company, reviewers are also asked to rate the CEO of the company. Surprisingly, the results were almost evenly split. While a little over half of our survey respondents said a negative rating of the CEO would have minimal to no impact on their decision to apply at a company, 42 percent said poor ratings of the CEO would have a moderate to significant impact on their decision to apply. Finally, our research found that the recency of Glassdoor reviews is a significant factor for potential applicants. When deciding whether or not they would apply at a company, almost half said they would only take into consideration reviews written in the last six months. 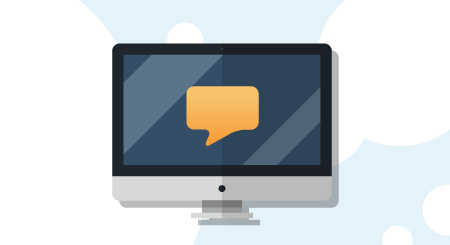 Keeping your reviews current is also something your company can impact simply by asking employees to leave a review every six months. When collecting our data, we also screened respondents by age, income level and urbanicity. We thought it might be useful to include this data to help companies determine what type of job applicants—entry-level, mid-level or senior-level—are most likely to be using online reviews in their job search, and in which geographic areas. Perhaps the most surprising finding was that job seekers between the ages of 55 and 64 were the most active demographic of Glassdoor users. In fact, over half of all Glassdoor users were above the age of 45. Meanwhile, individuals making between $25,000 and $49,999 a year were the most likely to use Glassdoor in their job search. This may be an indicator that entry-level to mid-level job seekers are the most likely to use Glassdoor while doing research on potential employers. Finally, rural users only made up about 15 percent of the total Glassdoor users. Job Seekers living in suburban and urban environments are much more likely to consult Glassdoor during their job search. Having a strong—and positive—presence on Glassdoor can improve your brand and help pique applicants’ interest in your company. After all, the majority of job seekers using Glassdoor do so to research top employers in their field. Simply having a profile on Glassdoor increases your company’s visibility to potential applicants. Of course, the tricky part is then ensuring your company’s reviews are as favorable as possible. Your company can get a head start by making sure you compensate your employees fairly and offer them a desirable benefits package, as positive ratings of compensation and benefits had the most significant impact on a jobseeker’s decision to apply. You should also make sure your company information is up-to-date, and guarantee that your profile has reviews that are less than six months old. To do this, you might encourage current employees to leave reviews. By acknowledging that you value their feedback, you may even garner quite a few positive comments. Finally, given that almost 60 percent of Glassdoor users make between $25,000 and $49,999 a year, if your company has open positions at this paygrade, you should definitely create a Glassdoor profile (if you haven’t already).